Travel disruptions caused by volcanic ash could be a thing of past if tests on aircraft prove successful. As part of an experiment by easyJet to test volcanic sensor detection equipment it plans to fit to its planes, an artificial ash cloud was created. The conditions were made to mimic those which caused widespread disruption and led to thousands of travel insurance claims when Icelandic volcano Eyjafjallajokull erupted in 2010. The eruption created a massive ash cloud in the atmosphere across vast areas of Europe, severely delaying flights and leaving passengers stranded across the world. In the experiment, a test plane dispersed one tonne of Icelandic ash into the atmosphere at between 9,000ft and 11,000ft. A second aircraft fitted with the Avoid (Airborne Volcanic Object Identifier and Detector) technology then flew towards the ash cloud, identifying and measuring it from around 40 miles away. In addition, a small aircraft was flown into the cloud to take exact measurements for comparison with those taken by the Avoid device. The cloud measured 600ft-800ft deep and was about 1.75 miles in diameter. It was initially visible to the naked eye, but became hard to identify once it began to dissipate. The Avoid device successfully detected the ash cloud and measured its density to be within the range of concentrations measured during the 2010 eruption. "Finding a solution is as crucial now as ever to ensure we never again see the scenes of spring 2010 when all flying ceased across Europe for several days," easyJet engineering director Ian Davies said. He called the development a "key step in the final journey of testing the technology and moving towards commercial certification" and added that easyJet will now work towards developing a "non-integrated stand-alone system". 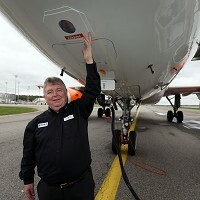 This system, Davies went on, is aimed to be fitted to a number of the airline's current fleet by the end of next year. Avoid inventor Dr Fred Prata said: "The team has just executed a unique scientific and engineering experiment conclusively demonstrating that low concentrations of ash can be identified by the sensor."